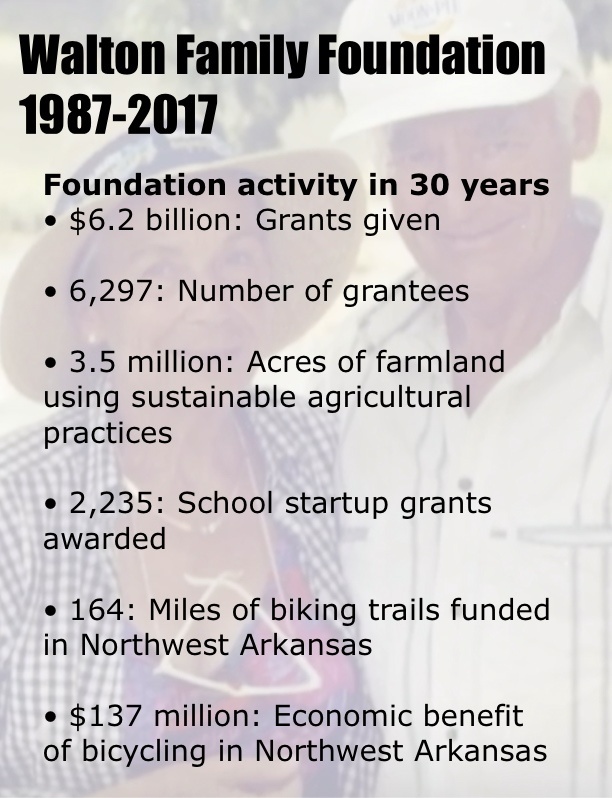 The Walton Family Foundation began 30 years ago and has given $6.2 billion in grants to a wide variety of groups in Arkansas and around the country. Last year, 47 groups in Benton and Washington counties received $52.537 million from the foundation, more than the $41.5 million in 2016 and $29.8 million in 2015. Overall the foundation awarded $535.5 million in grants last year across its four pillars. The foundation increased total giving in 2017 by $81 million, or 17.8%, from the previous year. In 2016, the foundation gave $454.4 million, up 21% from the prior year. Foundation Board Chair Carrie Walton Penner said a lot has changed over the past three decades, and as the family has grown so has the foundation. 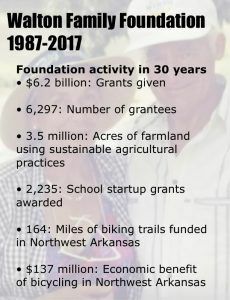 The Walton Family Foundation has given more $6.2 billion in grants over the past 30 years to 6,297 recipients. ems intensify daily, and we live in a time of increasing uncertainty and decreasing trust. Our desire to create access to opportunity for people and communities is now more important than ever. “For the Walton Family Foundation, what remain the same are the timeless values that inspired my grandparents. They envisioned a world where people can accomplish anything with opportunity and encouragement. The challenges have grown along with our commitment to making this vision a reality,” Penner noted in the report. Last year the largest benefactor in the local region in grants was the Helen Walton Children’s Center in Bentonville, which is in the midst of a major expansion. The childcare organization received $11.349 million in grants. With trails being a major focus of the foundation over the past several years, giving continues for organizations like Bentonville Bella Vista Trail Blazers Association who received $8.376 million last year from the foundation. Three other bike trail organizations received grants totaling $598,277. The arts in the region also received significant support last year from the foundation with Theatresquared receiving $3.797 million in grants, and Crystal Bridges Museum of American Art receiving $1.351 million. Another nine art-related grants were made totaling $1.776 million, the largest was a $531,102 grant to the Arkansas Arts Academy. All of the major cities in the region received financial support from the foundation. Downtown groups in Bentonville and Springdale also received grants last year totaling $360,000, and $132,370, respectively. The Community Development Corp of Bentonville-Bella Vista received $152,155. Educational groups also got a boost from the foundation last year with the Thaden School in Bentonville garnering the most at $2.99 million. Haas Hall Academy received $2.017 million in grants last year. 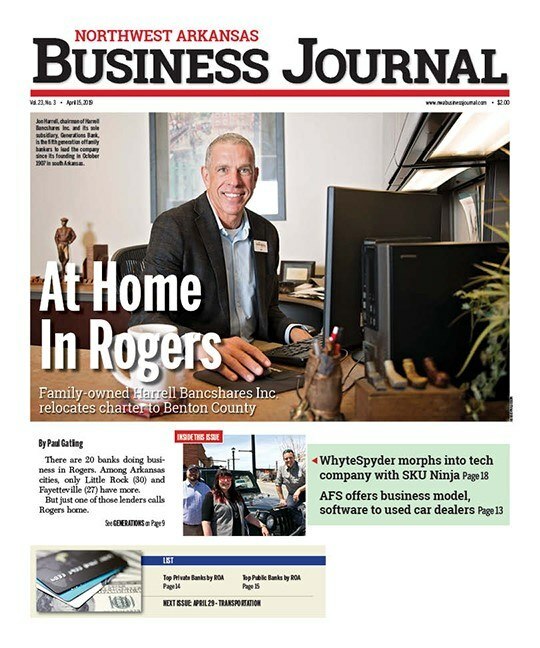 Bentonville schools received $106,500, Rogers schools received $117,316, and the University of Arkansas received $241,451. Northwest Arkansas Community College Foundation received $1.515 million and the University of Arkansas Foundation received $1.56 million, and the UA Fayetteville Campus Foundation received $2.029 million. The foundation also continues to support outdoor / environmental projects and organizations. State Park and Recreation Foundation of Arkansas received $1.033 million in grants last year, Watershed Conservation Resource Center received $227,480 and Upper White River Basin Foundation got $35,000. The Illinois River Watershed Partnership received $117,258 and the Beaver Watershed Alliance garnered grants worth $169,700. Outside of Northwest Arkansas the foundation also makes Home Region gifts in the Delta. Last year giving toward Delta projects totaled $6.82 million. Following are other gifts going to Arkansas organizations under the special projects umbrella. He said the foundation remains committed to being a partner to those who have creative ideas that confront challenges regarding the environment, education or quality of life issues. “We aim to remain steady in our approach to creating change and bold in our solutions learning from our successes and our failures,” Peterson said.